You should by now have used your powers of deduction to surmise that we weren't going to Happy Acres Holiday Camp in Pine Valley Pennsylvania. We were really heading north. 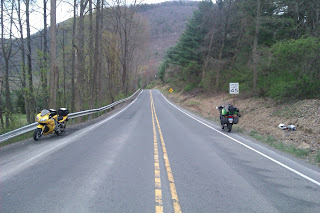 Rather than face the Iron Buttocks challenge that was the ride from West Virginia to East Connecticut on the last riding day, we had chosen to make our way more gradually north, mostly avoiding highways and trying to ride the bendy looking roads, as you do. This meant leaving West Virginia a day early but I liked that better than a mad dash on the last riding day. It was a good plan as well. The ride started with an amazing road that reminded me of home. It twisted and turned and felt like a road that people didn't tend to use if they weren't going to somewhere on it. The poor road surface also reminded me of many of my favourite Yorkshire roads. By the time we stopped to fit the Hero to my helmet, the best part was over but these things happen. 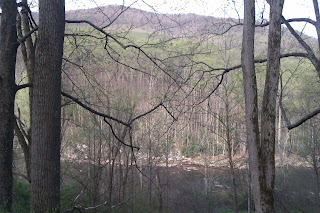 From the end of that road nothing was quite as technical (Dan's favourite riding) or dramatic (mine) as we had previously experienced in West Virginia, but it was scenic and I at least was enjoying it. We breakfasted in a seemingly typical small town diner, cruised through Small Town USA and I just loved watching America go by. As usual, we swapped bikes at fill ups and I found my self with a long ride on the SV. Strangely, perhaps because there was so much to look at, it didn't hurt as much as usual. It didn't leave me quite as stiff and I was happy enjoying the whole slog. 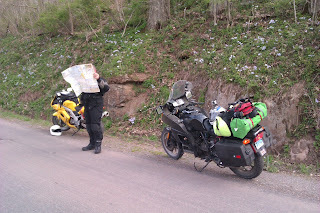 Dan had also badgered me into navigating from maps rather than depending on the GPS. Several previous user errors on both our parts had proved that we just needed to be old school. The SV had the only working Satnav but also the only tank bag (and therefore map case) thus whoever rode it ended up leading. It felt good to actually navigate properly and it also meant that I was further distracted from any discomfort. In truth, the necessarily cramped/sports riding position is the only fault I would claim for the SV which is otherwise a superb machine with an amazing motor, gearbox, frame and controls. In fairness, how can you list as a fault, something it isn't intended for. I wouldn't have one but I'd quickly recommend it to someone who wants a sports bike. Anyway, after a long slog, including some dual carriageway, we stopped for coffee and cake (turtle cheesecake, yum yum yum!) Then we headed out for the first road that promised real technical challenge. 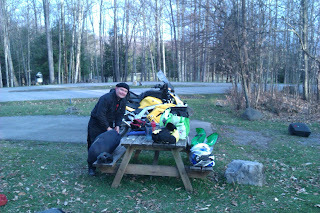 The bikes were getting low on fuel and we were hoping to find some in what looked to me to be a underpopulated part of the woods. 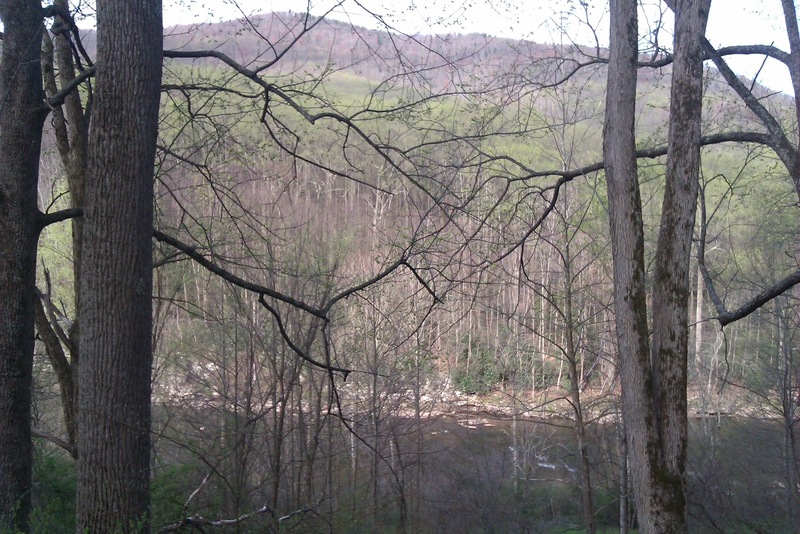 I was doubtful that such a forest would be a great place to find fuel but Dan was hopeful. I just figured, 'What the hay. We're on an adventure!' I'd studied the route and carefully folded the map. We had 100 miles to go before we planned to treat ourselves to a motel and there was a good two hours before the light started to fail. Everything was fine, if a little tight. The first thing that went wrong was my fuel light came on just as we were really getting into the state forest. Then, I missed the turning, noticed it far to late, attempted to slow enough with just the front brake and then flew past in the certain knowledge that I couldn't. I could see in my mirrors that Dan seemed to be stopping, I thought because he had spotted my mistake. A safe place presented it's self and I turned the SV around. Dan however was still where he had stopped and I to pulled up. I was about to find that I wouldn't ride the RT again. Dan had lost drive. The steep down hill into a fairly tight bend, my rapid deceleration on realising we were about to fly past our turning and old age proved too much for the RT. As I write, the unconfirmed diagnosis is that the input shaft spines have sheered so the clutch is spinning freely. Either way it was the end of the road for the RT. No one could fix that in the field. Dan was gutted. I was gutted. I loved that bike and didn't want to see it fail. I didn't want our trip to be over either but in a way it wasn't anyway. For a start, it's how we met Lyrian. It just so happened that in that wilderness, we broke down next to a private road leading to hunting lodges and one or two permanently occupied residences. The door Dan knocked on was Lyrian's and she couldn't have been more helpful. Without hesitation she let us keep the RT at her home. Then she booked us a cabin at Happy Acres. Then she packed our things in her car and drove Dan over. She waited patiently while we fuelled up the SV and then took us to the lodging she had organised. So it really wasn't over. It was just turning into a real adventure with a greater variety of twists and turns than we had bargained for. Sure one bike was stuffed and the other showing signs of fatigue but really; we were safe, we had made a new friend in a time of need and we had a few options as to how we would get me to the plane on time (roughly 48 hours from when the bike broke down). 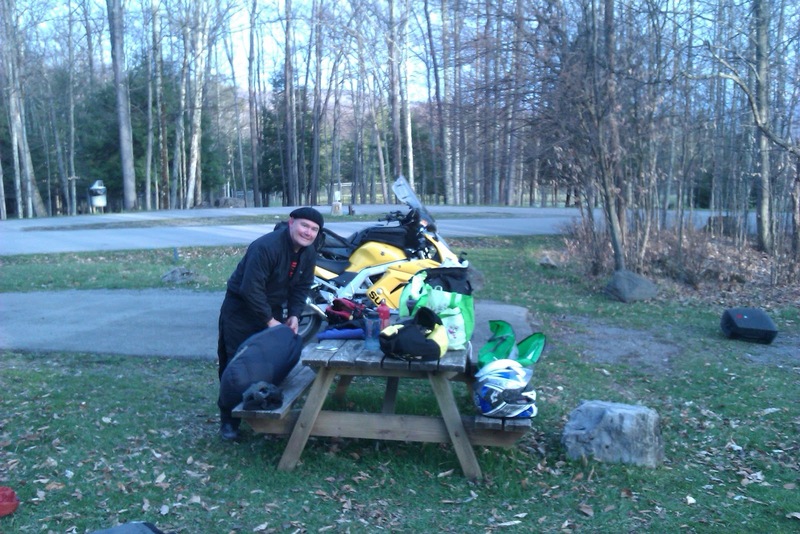 We could hire a car and carry on as we had been doing but swapping from bike to car. I could fly back from near where we were. We could just hire a Uhaul truck and carry both bikes back that way. The only thing we couldn't do was call the AA as my membership is pretty limited. Either way, the trip in whatever form it would take, was still very much on. It had to be. I had a flight to catch and was really beginning to miss my family.